Connecting two optical fibers with connectors is not a simple task. Optical fibers are very small, on the size of a human hair, and require careful alignment of the fibers to get low loss. The actual effects of misalignment are affected by the distribution of light in the fiber (mode power distribution). A fully filled fiber has more light in the higher order modes and is more sensitive to geometric effects. The blue line on the graph shows the projected connector loss for a 50 micron nominal core in overfilled mode condition connected to fibers with cores of minimum size up to it's own diameter. 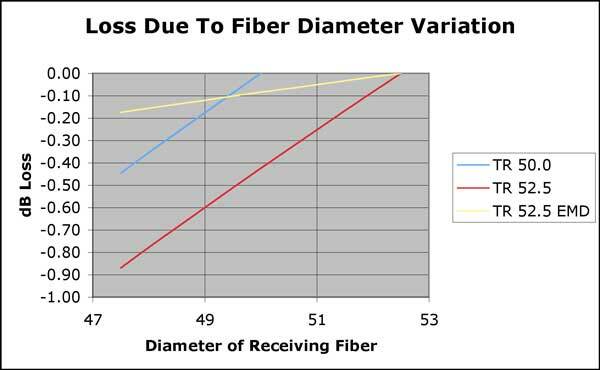 If a smaller fiber is connecting to a larger fiber, there is no excess loss due to diameter variations. 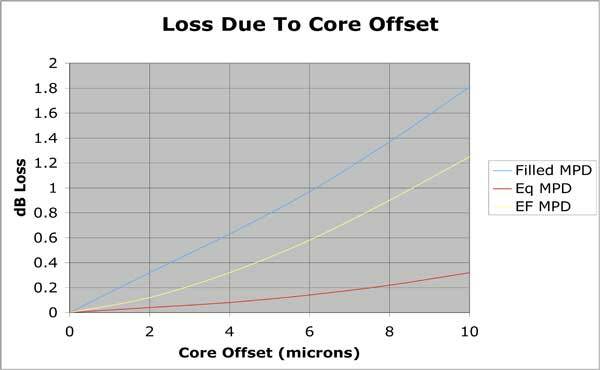 The red line on the graph shows the projected connector loss for a 50 micron nominal core in overfilled mode condition connected to fibers with cores of minimum size up to it's own diameter. The yellow line shows the projected connector loss for a 50 micron nominal core in equilibrium mode distribution (EMD) condition (which is lower mode fill than EF) connected to fibers with cores of minimum size up to it's own diameter. The difference between the losses of a fully filled fiber and a EMD fiber are startling - but illustrative of how important mode fill is to the measurement of connector loss. Lateral offset of the cores of the fiber can be caused by fibers with offset cores or the connector. Within the connector, the hole in the ferrule is bigger than the fiber so it can be easily inserted, even with adhesive in the hole. The fiber may not end up in the center of the hole, although rotating the fiber during insertion tends to center it due to the surface tension of the liquid adhesive. The fiber hole in the ferrule may not be centered in the ferrule or may be offset from its proper location as in multifiber connectors. The blue line on the graph shows the projected connector loss for a 50 micron nominal core in overfilled mode condition and the red line shows the loss for a fiber in EMD and the yellow line for modal distribution approximating the new EF standard. Again, note the large differences caused by the mode power distribution in the fiber. Angularity is usually caused by misalignment in a mating adapter, but can also be caused by the hole in the connector ferrule being larger than the fiber so it becomes misaligned. 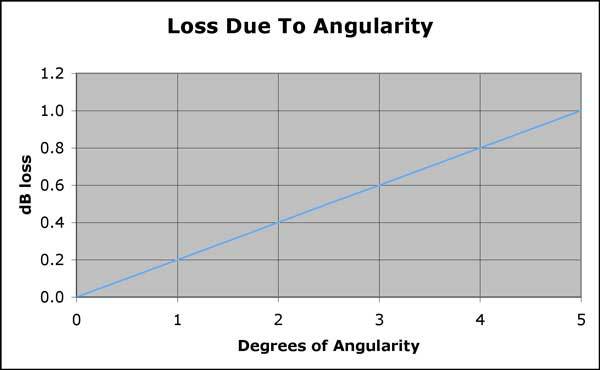 We were unable to find data on the effects of MPD on angularity, but one should assume the loss would be considerably smaller than this data for fully filled fibers. We are not covering other issues like core or connector ferrule ovality which can affect the loss of connectors. Why Are "Real" Connectors Low Loss? If one looks at this data, it could be assumed that connectors would have typical losses over 1 dB, but we know such is not the case. A good adhesive/polish multimode connector on 50/125 fiber will have losses under 0.3-0.4 dB dB. First of all, the specfications for parameters like core diameter and offset are worst case specifications, kept in the standards because there are errors associated with measuring those parameters and no manufacturer (who probably participated in the writing of those specifications) wants to reject fiber for geometric reasons. And in fact, most fibers manufacturerd by legitimate manufacturers today are made to much tighter tolerances than these specifications. In addition, most measurements are made with some form of mode conditioning that is well below fully filled but probably not as low as EMD, e.g. the traditional mandrel wrap mode conditioner. 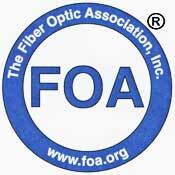 (C)2011, The Fiber Optic Association, Inc.